I am continuing my mini-series on modern US monetary history through the lens of my decomposition of supply inflation and demand inflation based on what I inspired by David Eagle have termed a Quasi-Real Price Index (QRPI). In this post I will have a look at the early 1980s and what have been termed the Volcker disinflation. When Paul Volcker became Federal Reserve chairman in August 1979 US inflation was on the way to 10% and the fight against inflation had more or less been given up and there was certainly no consensus even among economists that inflation was a monetary phenomenon. Volcker set out to defeat inflation. Volcker is widely credited with achieving this goal and even though one can question US monetary policy in a number of ways in the period that Volcker was Fed chairman there is no doubt in mind my that Volcker succeed and by doing so laid the foundation for the great stability of the Great Moderation that followed from the mid-80s and lasted until 2008. Below you see my decomposition of US inflation in the 1980s between demand inflation (which the central bank controls) and supply inflation. As the graph shows – and as I spelled out in my earlier post on the 1970s inflationary outburst – the main cause of the rise in US inflation in 1970s was excessive loose monetary policy. This was particularly the case in late 1970s and when Volcker became Fed chairman demand inflation was well above 10%. Volcker early on set out to reduce inflation by implementing (quasi) money supply targeting. It is obviously that the Volcker’s Fed had some operational problems with this strategy and it effectively (unfairly?) undermined the idea of a monetary policy based on Friedman style money supply targeting, but it nonetheless clearly was what brought inflation down. The first year of Volcker’s tenure undoubtedly was extremely challenging and Volcker hardly can say to have been lucky with the timing. More or less as he became Fed chairman the second oil crisis hit and oil prices spiked dramatically in the wake of the Iranian revolution in 1979. The spike in oil prices boosted supply inflation dramatically and that pushed headline inflation well above 10% – hardly a good start point for Volcker. 1) Initially Volker dictated disinflation by introducing money supply targeting. The impact on demand inflation seems to have been nearly immediate. 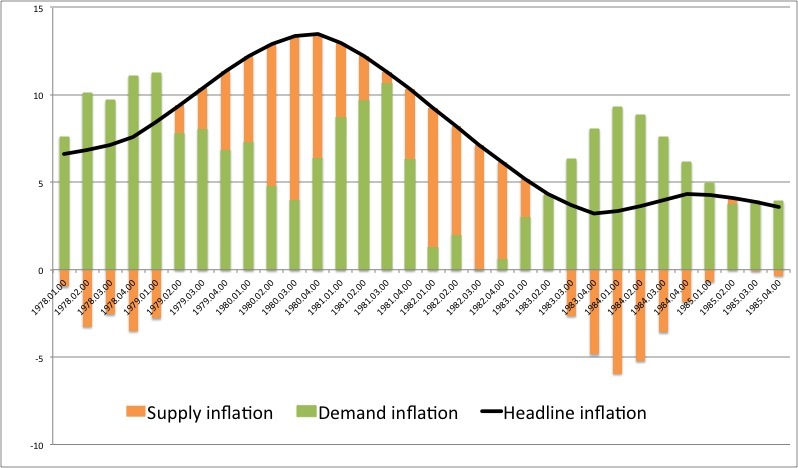 As the graph shows demand inflation dropped sharply in1980 and the only reason headline inflation did not decrease was the sharp rise in oil prices that pushed up supply inflation. 2) The significant monetary tightening sent the US economy into recession in 1980 and this lead Volcker & Co. to abandon the policy of monetary tightening and “re-eased” monetary policy in the summer of 1980. Again the impact seems to have been immediate – demand inflation picked up sharply going into 1981. 3) Over the summer the Fed moved to hike interest rates dramatically and slow money supply growth sharply. That caused demand inflation to ease off significantly and inflation had finally been beaten. 4) The Fed allowed demand inflation to pick up once again in 1984-85, but at that time Volcker was more lucky as supply factors helped curb headline inflation. The zigzagging in monetary policy in the early 1980s is clearly captured by my decomposition of inflation. To me shows how relatively useful these measures are and I think they could be help tools for both analysts and central bankers. This post in no way is a full account of the Volcker disinflation. Rather it is meant as an illustration of the Quasi-Real Price Index and my suggested decomposition of inflation. My two main sources on modern US monetary history is Robert Hetzel’s “The Monetary Policy and the Federal Reserve – A History” and Allan Meltzer’s “A History of the Federal Reserve”. However, for a critical account of the first years of the Volcker disinflation I can clearly recommend our friend David Glasner’s “Free Banking and Monetary Reform”. I am significantly less critical about money supply targeting than David, but I think his account of the Volcker disinflation clear give some insight to the problems of money supply targeting. American Alex Salter is a good example of the open-minded Austrians who has welcomed the dialogue with Market Monetarists. In my own part of the world Austrians is also engaging us in a serious fashion. A good example is Anthony Evans – self-declared Austrian, monetary specialist and Associate Professor of Economics at London’s ESCP Europe Business School, and Fulbright Scholar-in-Residence at San Jose State University. Anthony is endorsing a NGDP target for the Bank of England. See his latest comment from City A.M. here. See also this earlier comment. In general it is interesting how British monetarists as well as British Austrian school economists seem to be much more open to Market Monetarist ideas than their counterparts in the US and in continental Europe. In that regard it should be noted that the Bank of England probably is the central bank in the world that is taking NGDP targeting most serious. I have just printed three papers to (re)read when the rest of the family will be sleeping tonight. You might want to have a look at the same papers. The two first are connected. It is Lastrapes’s and Selgin’s 1995 paper “Gold Price Targeting by the Fed” and McCallum’s 2006 paper “Policy-Rule Retrospective on the Greenspan Era”. Both papers are basically about how the Greenspan conducted monetary policy. The hypothesis in the first paper is that the Greenspan Fed used gold prices as an indicator for inflationary pressures, while the other is a restatement and an empirical test of the so-called McCallum rule. The McCallum rule basically saying that the Fed is targeting nominal GDP growth at 5% by controlling the money base. As both papers confirm their hypothesis why not combine the results from the two papers? The Fed reserve controls the money base to ensure 5% NGDP growth and use the the gold price to see whether it is on track or not. Okay, lets be a little more open-minded and lets include other asset prices and lets look at more commodity prices than just gold. Then we have rule, which I have earlier called a McCallum-Christensen (yes, yes I have a ego problem…). d is %-quarterly growth, B is the money base (or rather I use MZM), V is the 4-year moving average of MZM-velocity and NGDPMI is a composite index of asset prices that all are leading indicators of NGDPMI. In my constructed NGDPMI I use the following variables: S&P500, the yield curve (10y-2y UST), the CRB index (Commodity prices) and an index for the nominal effective dollar rate. I have de-trended the variables with a four-year moving average (thats simple), but one could also use a HP-filter. I have then standardized each of the variable so they get an average of 0 and a standard deviation of 1 – and then taken the average of the four sub-indicators. And guess what? It works really well. I can be shown that during the 1990ties the Fed moved MZM up and down to track market expectations of NGDP captured by my NGDPMI indicator. This is the time where Manley Johnson and Bob Keleher played an important role in the conduct and formulation of monetary policy in the US. As I have earlier blogged about I fundamentally think that the Johnson-Keleher view of monetary policy is closely connected to the Market Monetarist view. The McCallum-Christensen rule also fit relatively well in the following period from 2000 to 2007/8, but it is clear that monetary policy is becoming more erratic during this period – probably due to Y2K, 911, Enron etc. Hence, there is indications that the influence of Johnson and Keleher has been faithing in that period, but overall the McCallum-Christensen rule still fits pretty well. Then the Great Recession hits and it is here it becomes interesting. Initially the Fed reacts in accordance with the McCallum-Christensen rule, but then in 2009-2010 it becomes clear that MZM growth far too slow compared to what the MC rule is telling you. Hence, this confirms the Sumnerian hypothesis that monetary policy turned far to negative in 2009-10. So why is it that I am not writing a Working Paper about these results? Well, I might, but I just think the result are so extremely interesting that I need to share them with you. And I need more people to get involved with the econometrics. So this is an invitation. Who out there want to write this paper with me? And we still need some more number crunching! But for now the results are extremely promising. PS I promised something on Selgin and this was not really enough…but hey the guy is great and you are all cheating yourselves of great inside into monetary theory if you don’t read everything George ever wrote. I didn’t expect this ever to happen, but I have to say something nice about Paul Krugman’s comments on his New York Times blog. Well, there is actually a lot of positive to say about Paul Krugman, but we just tend to forget it when he is giving us free market economists a hard time. However, the story today is not about what we think, but “where” we express our views and share our research. As I have tried to argue in my paper “Market Monetarism – the second Monetarist counter-revolution” Market Monetarism is a school of economic thought basically born and shaped in the blogosphere. Krugman has a positive view on what the blogosphere has done to open up the economic profession and haow the blogoshere is helping improve economic research. “What the blogs have done, in a way, is open up that process. Twenty years ago it was possible and even normal to get research into circulation and have everyone talking about it without having gone through the refereeing process – but you had to be part of a certain circle, and basically had to have graduated from a prestigious department, to be part of that game. Now you can break in from anywhere; although there’s still at any given time a sort of magic circle that’s hard to get into, it’s less formal and less defined by where you sit or where you went to school. So here we go again – I agree with Krugman. The blogosphere is opening up our profession and Krugman deserves credit for taking this debate serious. Have a look at Krugman’s comment here and share you views both here and on Krugman’s blog. Here is Nick Rowe on central banks and Chuck Norris. If you don’t understand Chuck you don’t understand central banks.